APC takes campaign trail to the Northern Cape - SABC News - Breaking news, special reports, world, business, sport coverage of all South African current events. Africa's news leader. Themba Godi took his campaign trail to the settlement which has no water, sanitation or roads. 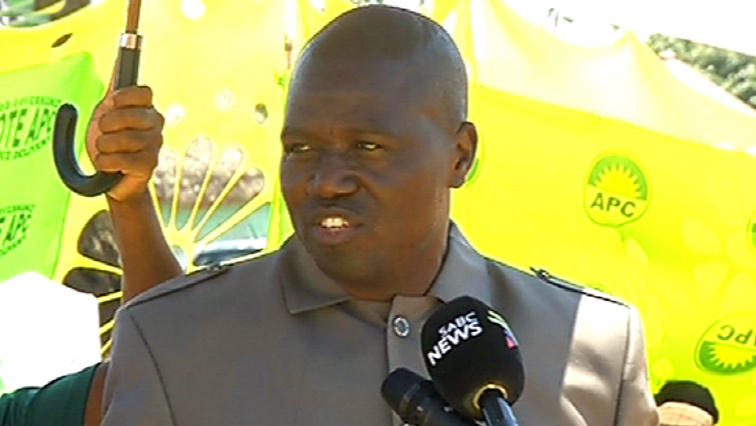 The leader of the African People’s Convention (APC), Themba Godi, says the Informal Settlement of Mountain View at Postmasburg in the Northern Cape is an example of the failure of the current provincial government. Godi took his campaign trail to the settlement; which has no water, sanitation or roads. Residents of Mountain View say hope has been revived following a door-to-door campaign by APC leader. After years of living in squalor, the residents insist there has never been a party leader visiting the settlement to witness their poverty. The APC leader says his track record as a fierce, no nonsense parliamentarian should give residents an idea of his dedication to good governance. The APC which currently has one seat in parliament is aiming to have influence on governance and policies in the country, post the May 8 Elections. Godi believes this is attainable through the 1 million votes they are gunning for.